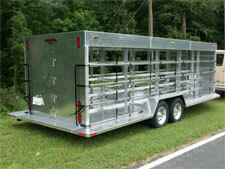 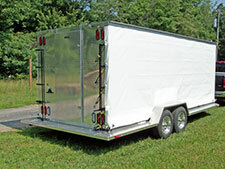 This trailer is a 29 crate pigeon trailer with dual axles, electric brakes, crate size: 72"x24"x12", steel main frame with remainder of trailer constructed of aluminum, all required DOT lights and reflectors, LED lights, release system for all crates, 2" insulation on roof, 8" airspace above top of top crates, 1 piece aluminum roof and floor, 15" aluminum rims with spare tire and wheel, operable louver front and rear vents, tongue storage box/wind breaker, soft sides. 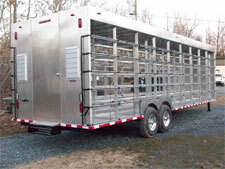 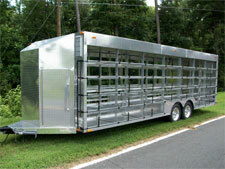 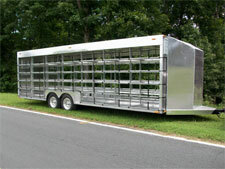 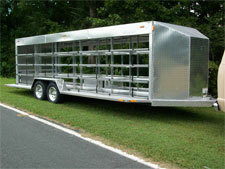 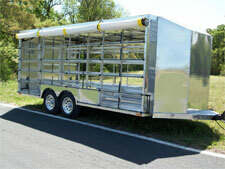 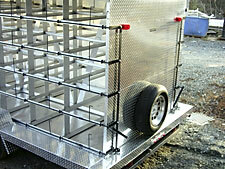 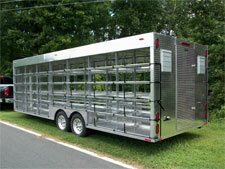 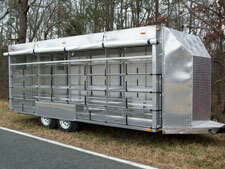 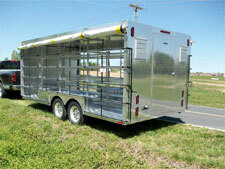 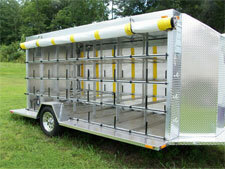 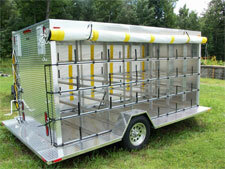 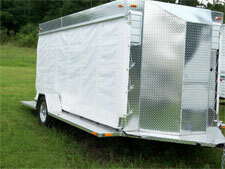 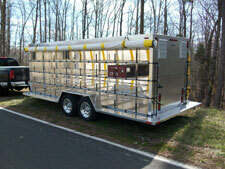 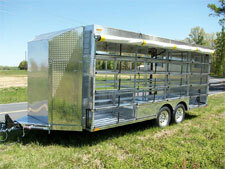 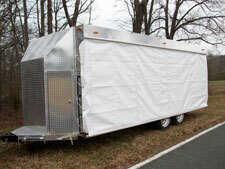 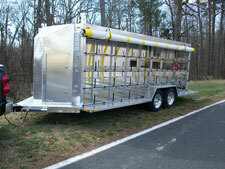 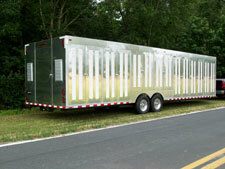 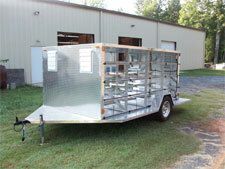 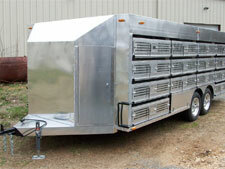 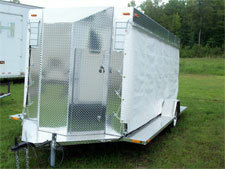 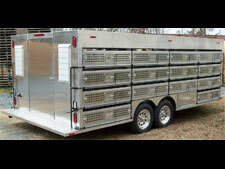 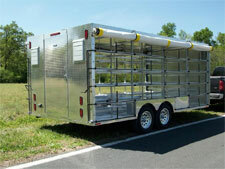 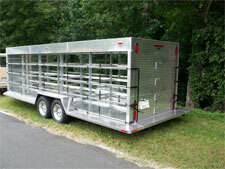 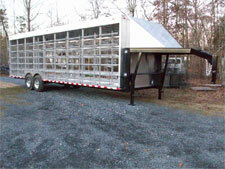 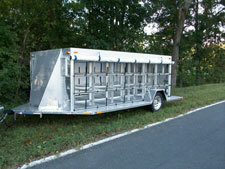 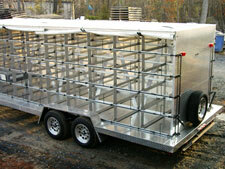 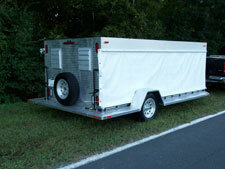 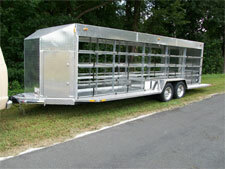 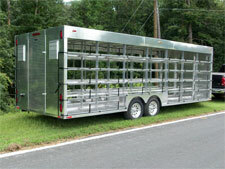 Custom built trailer for transporting and releasing racing pigeons. 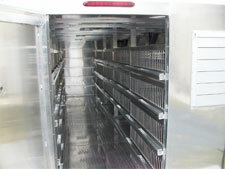 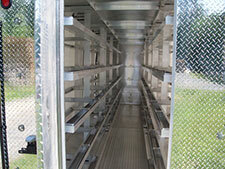 This trailer had a custom built rack system capable of holding 96 bird cages and a release system so the doors on all 96 cages could be opened simultaneously. 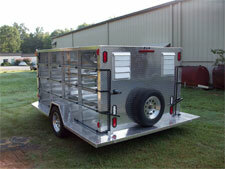 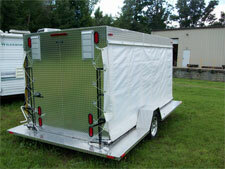 This trailer also had a custom tongue mounted wind breaker/storage box, roof ventilators, canvas sides and running boards for ease of loading. 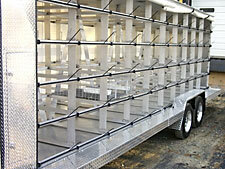 What ever your need in bird transportation let us work with you to achieve the ultimate goal you desire. 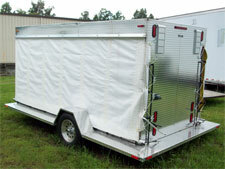 The trailer below was a 30 crate Pigeon Trailer that included removable feed and water trays, spare tire, tongue jack, release system, front and rear vents, single axle with electric brakes and aluminum rack system. 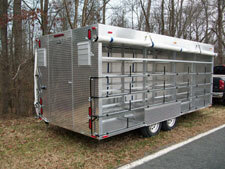 The trailer below is a 28 crate Pigeon Trailer, dual axle, electric brakes one axle, center walk-way, water & feed trays for each crate, 4 pop-up roof vents, operable louvers on rear, tongue wind breaker/storage area, 4 interior lights in walk-way, release system for all cages. 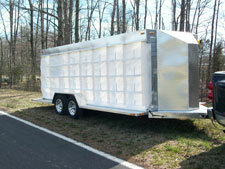 Trailer shown with PCA431 crates installed. 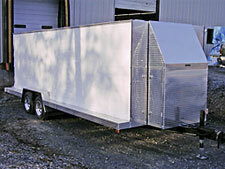 This trailer is a 22 crate pigeon trailer, single axle, electric brakes, steel main frame with remainder of trailer constructed of aluminum, all required DOT lights and reflectors, LED lights, release system for all crates, 2" insulation on roof, 8" airspace above top of top crates, 1 piece aluminum roof and floor, 15" aluminum rims with spare tire and wheel, operable louver front and rear vents, tongue storage box/wind breaker, soft sides. 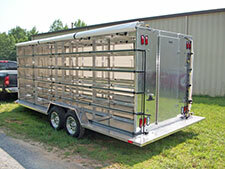 This trailer was set up for a crate size of 72"L x 24"W x 12"T.
This trailer is a 36 crate pigeon trailer with dual axles, electric brakes, center walk-way, crate size: 46"W x 30"L x 11"T, steel main frame with remainder of trailer constructed of aluminum, all required DOT lights and reflectors, LED lights, release system for all crates, 2" insulation on roof, 8" airspace above top of top crates, 1 piece aluminum roof and floor, 15" aluminum rims with spare tire and wheel, operable louver front and rear vents, Interior lights in walk-way, tongue storage box/wind breaker, water system..